Between 1962 and 1968 Carroll Shelby built only 654 small-block Cobras and 350 big-block models, so they are rare and very expensive. At Barrett-Jackson's 2015 Scottsdale auction a 1965 Shelby Cobra 427 sold for over $1.5 million, and in 2016 the very first Shelby Cobra sold at an auction at Pebble Beach for over $13 million! Luckily for us regular folk, companies like Backdraft build Cobra replica kits. With a Cobra replica kit, you can own your own Shelby Cobra without breaking the bank. You'll have the opportunity to experience what performance driving is all about. You can have a classic car of your own and you can fully customize it to your personal tastes! The Backdraft difference... A Backdraft Racing Roadster stands out from the crowd with unsurpassed quality, design and performance. Backdraft Racing's renowned attention to detail makes every custom roadster and authentic replica the very best available. Fast Lane Classic Cars and the team behind every meticulously hand-built Backdraft Roadster is right by your side with backup, service, support and legendary customer service... long after you take your beast home! 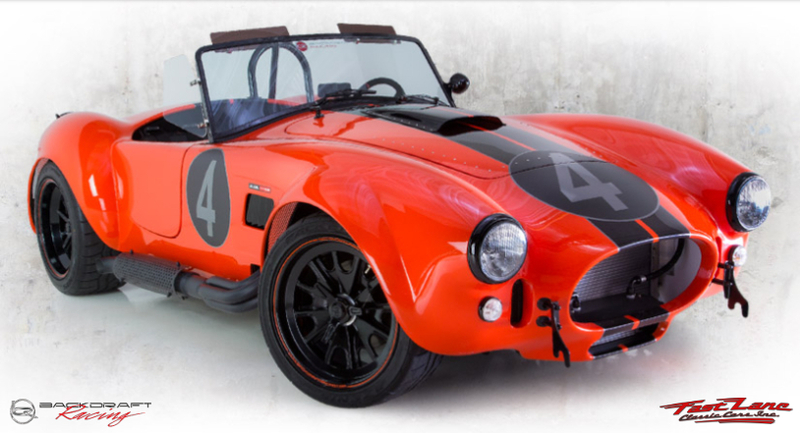 Call us at 636-940-9969 or email sales@fastlanecars.com today to start designing your custom hand-built Backdraft Cobra!